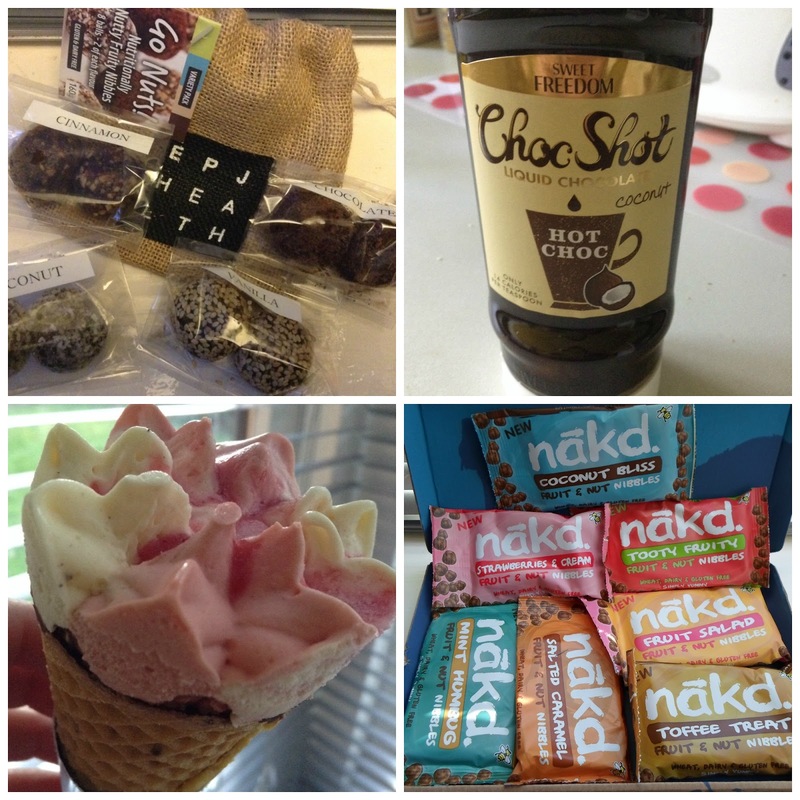 New to Me Free From Products - Nakd, Choc Shot, Tesco Cones, Go Nuts! It's been a good few weeks in the Sugarpuffish household, discovering new to me free from foods has been very exciting and I have been tracking them down. I often make little snack bites at home but a while back I spotted Go Nuts! * on Not On The High Street website. Go Nuts! are available in four flavours and are free from dairy, gluten, refined sugars, preservatives, additives and GMOs. A nice treat for yourself or a present for someone who enjoys a healthy lifestyle. The original Choc Shot has been a staple in my kitchen cupboard since I discovered it but I had to track down the new Coconut version. I believe it's currently exclusive to Holland & Barrett and oh boy! it's fantastic. I love coconut so this is a match made in heaven. The Tesco Free From Strawberry & Vanilla Cones (dairy free & gluten free, Vegan) have been the talk of twitter but every time I tried to buy them they were out of stock. I got lucky the other weekend and snapped up the last box. I was hesitant at first because I think Tesco Vanilla dairy free ice cream (in the tub) is pretty horrid but the strawberry in the cones is what makes these work for me. Tastes like strawberry milkshake. I've been addicted to the Nakd Cocoa Delight bars for years so imagine my excitement when I spotted these Nakd Fruit & Nut Nibbles in Sweet Shop flavours. I ordered myself a box from their website but I also spotted some flavours available in Sainsbury's. So far Coconut and Toffee are my top favourites. Let me know if you have tried any of these Free From foods or have you now added them to your shopping list. I'm loving the Nakd nibbles. We cleared sainsburys out of the Salted Caramel ones :) does the choc shot contain coconut or is it just flavoured? Yum! All of these look delicious! I saw the Tesco ice cream cones on my friend's facebook but unfortunately I am not within easy reach of a Tesco. I've never seen that style of nakd bar before! I'm a big fan of the brand considering it's all wholefood "smooshed" together as they like to say, so I'll have to pop into Sainsbury's to find these ones. Thanks for letting me know about them! What's the choc shot like? always been interested in trying it! I love nakd bars so I'll have to check out the nibbles! The rest look pretty good too!